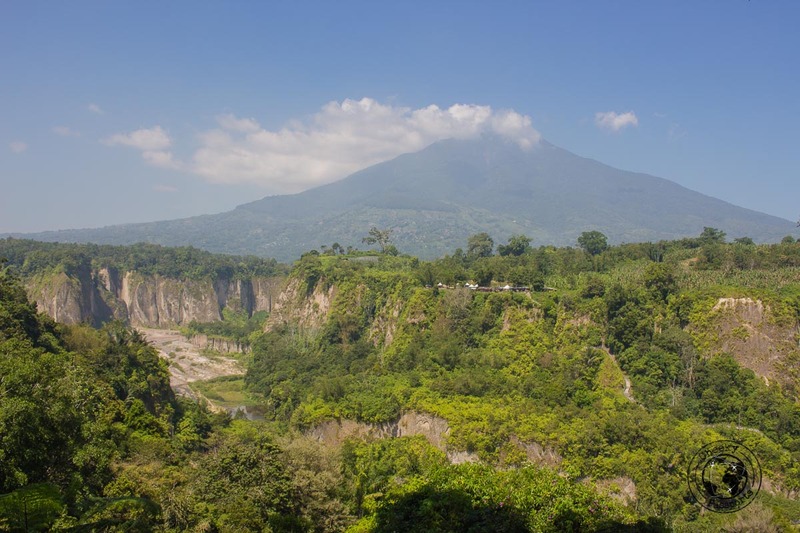 Bukittinggi is a little Sumatran hill town with a mild cool climate. 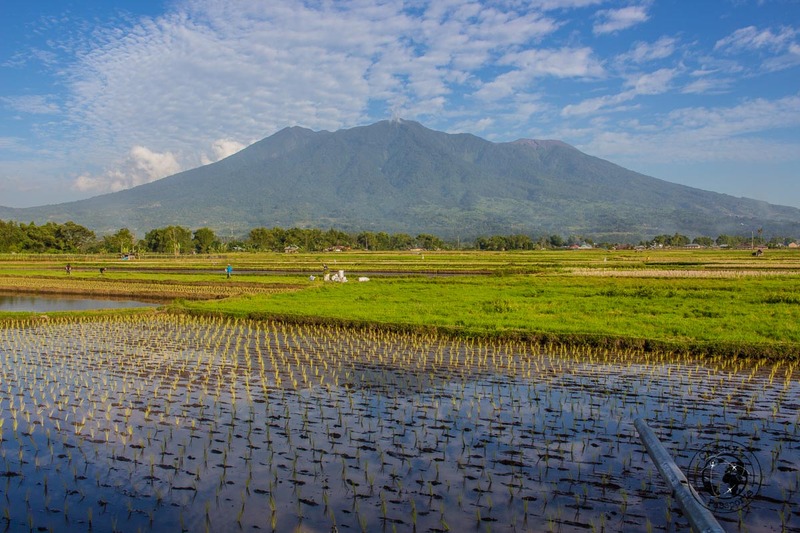 Most of the things to do in Bukittinggi are actually all outside town and require the use of a car, bike or joining a tour. 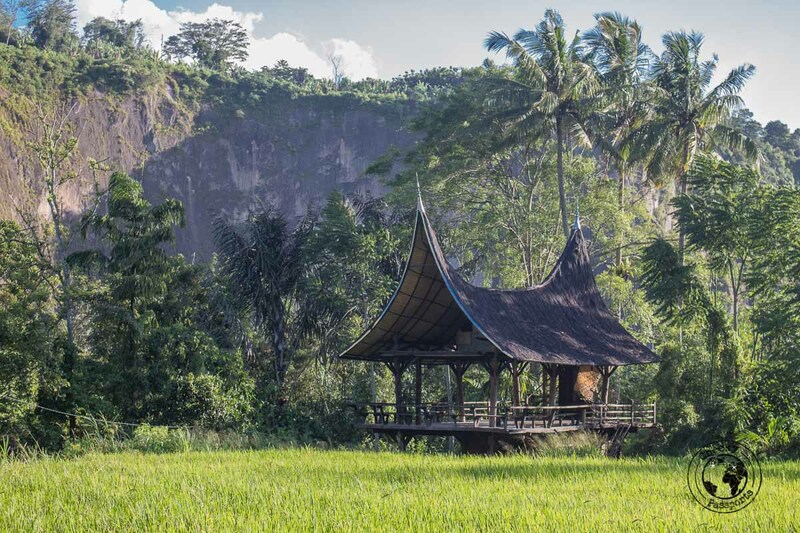 Bukittinggi, is a perfect base for exploring the lush, fertile surroundings and landscape of West Sumatra, an area full of dramatic valleys, canyons and lakes renowned for its natural beauty. There are not many things to do in Bukittinggi itself, and it is not particularly remarkable except for being home to convenient facilities which can make your stay easier. Getting to Bukittinggi is not simple and may take very long depending on where you are coming from. If you are already in West Sumatra, Padang would be your quickest gateway to Bukittinggi. Minivans depart from Basko Grand Mall in Padang. If you are coming from the airport, you need to take the Damri Airport bus to the Basko Grand Mall first, and then the minivan. Shared taxis are usually available from the airport direct to Bukittinggi. Since we were based in Lake Toba, our options included booking a seat on a bus or booking a seat in a “public car” to Bukittinggi. Both options were priced similarly, so we opted for the car thinking that the journey might be more comfortable, but wrong we were! 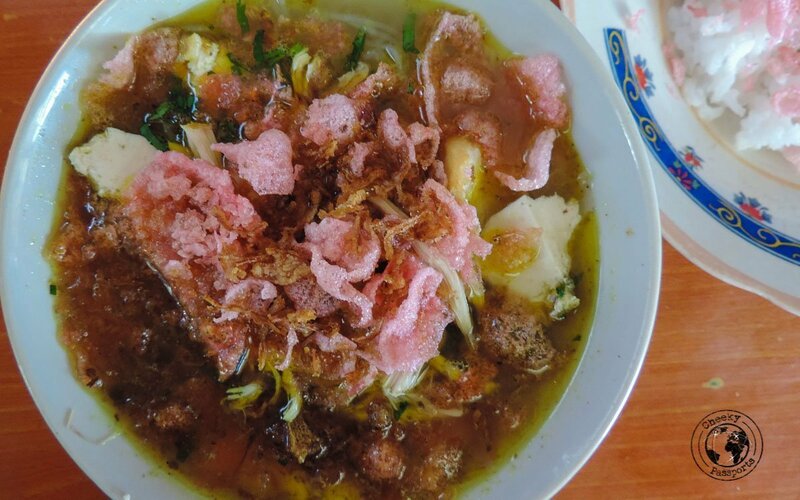 So much so, that throughout the journey we wondered whether the things to do in Bukittinggi and he surrounding area would justify our great discomfort! A “seat in a car” actually meant that 10 people were squashed in a 7- seater. I was cramped with another woman next to the driver. She was practically sitting on me and kept falling asleep on my shoulder. My backpack was lodged between my legs which were constantly numb from the lack of movement. 16 hours of that was no fun! We left at around 8pm, at which point the sickly tunes of Air Supply were playing on repeat. Later on, this was replaced by techno and later on by some kind of Indonesian folk music. All this for 16 hours. 16 hours of loud music thumping in my head as we drove along pot-holed, winding, rubble roads in pitch darkness. I kept reminding myself that the inconvenience was better than having the driver fall asleep. Yes, the same driver drove our car for 16 hours straight with a mere 30 minutes’ break every 4 hours! The whole journey was a nightmare from beginning to end, and the fact that Nikki was complaining every few minutes did not help (he wanted us to go by car from Parapat to Medan which would take about 6 hours, then take a flight to Padang and then a car to Bukittinggi for about 3 hours which would anyway result in having to spend 10 hours in a car plus a flight. This made absolutely no sense me, but Nikki still insists it’s the best route to take). Of course, we have no experience in doing the journey by bus but I am utterly convinced that it would have been just a tad more comfortable, albeit longer. The fact that we would actually have had an individual seat to sit on would have made the trip a lot better for starters! The total cost of the commute was 350,000 IDR (Indonesian rupiah) (about €22). A seat on a bus would have cost 300,000 IDR (about €19) but we think that it would have been a lot more comfortable! If you have the option, go for the bus, keeping in mind that booking a seat (or two) is also a challenge in itself! A bus operates the route from Medan to Bukittinggi. It is the same bus that also passes through Parapat. The commute from Medan to Bukittinggi takes about 21 hours. It has been described elsewhere as a “nightmare” journey. Following our horrible commute from Lake Toba to Bukittinggi, we have no doubt that the Medan to Bukittinggi has been adequately described! We thought about giving this a miss especially since the attraction requires an entry fee of IDR 20,000 (about €1.25). Affordable but still, paying for a view didn’t seem worthwhile considering that we are traveling on a rather restricted budget. However, the view of Sianok Canyon from the park is stunning and the Japanese tunnels (used during the 2nd world war by Japanese soldiers) was rather interesting! 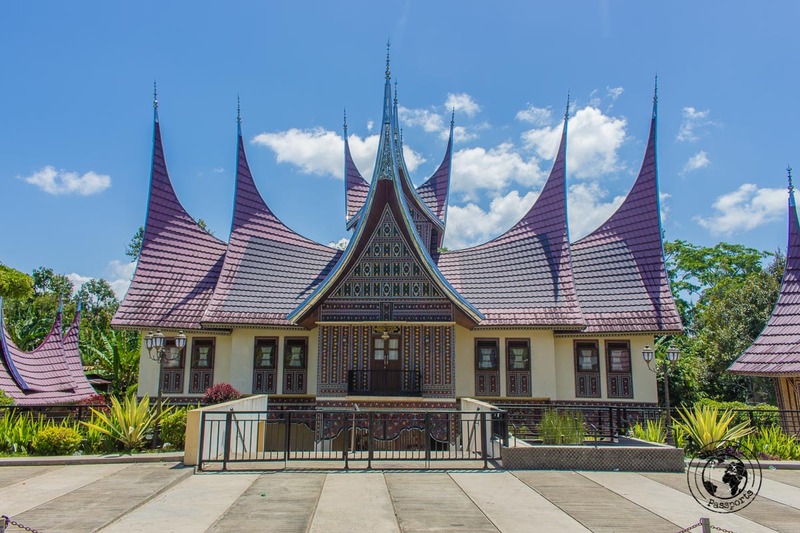 The complex is just on the outskirts of town and we really recommend that you put this attraction on your list of things to do in Bukittinggi! Fort de Kock was built by the Dutch to safeguard the city, but there isn’t much left of it to see nowadays, although there are some good views over the city to be had. The caged animals kept here are rather depressing and although it is one of the town’s landmarks, we do not suggest that you it include on your list of things to do in Bukittinggi. The wonderful Sianok Canyon is easily navigable via motorbike. 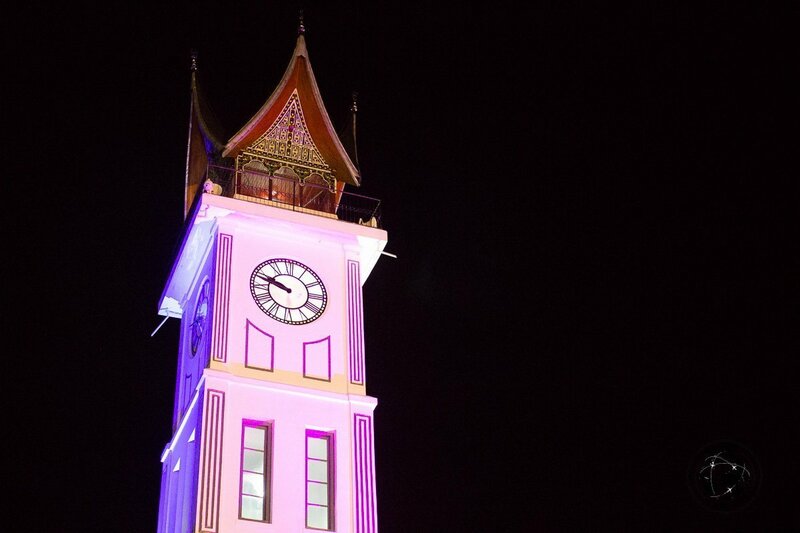 We found this to be one of the most pictruesque things to do in Bukittinggi! The scenery was almost outworldly, with a road passing through fields and a small village surrounded by the canyon walls. The path to and from the canyon is rather steep though, so a more powerful bike is preferred! 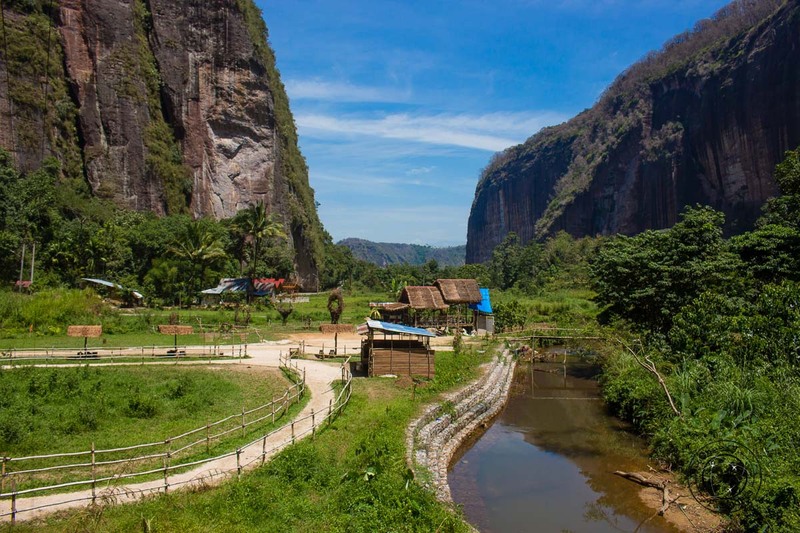 Visiting the wonderful Harau Valley was at the top of our list of things to do in Bukittinggi in the first place, and our main reason for taking a trip to the region of Bukittinggi, Sumatra. We hired a motorbike from our hotel for 60,000 IDR (€3.80) and drove to the valley in about 90 minutes, navigating through some traffic on the way. The entrance to the valley is very dramatic with steep cliffs on either side of it. 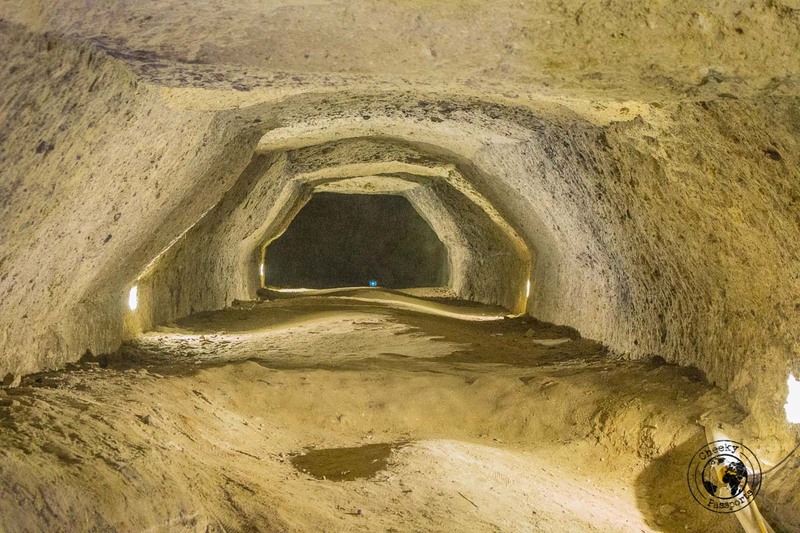 We felt as though it was a portal to a different world…and different it was! As soon as we drove a few meters through the valley, we noticed that everything was suddenly a lot more laid-back, and a lot more tranquil than what we had experienced in town. Most of all, the different shades and intensity of green were incredible. Biking through the valley was actually an experience we found very relaxing, whereby we quickly forgot about the previous day’s nightmarish commute. The beautiful surroundings ensured that we were in a great mood throughout the rest of the day! The road though the valley is surrounded by spectacular rice fields and hordes of water buffalo grazing on the fertile land. It was so quiet when we were there that we could hear the distant sounds of traffic from outside the valley and the chirping of birds around us. We drove past a waterfall and then walked to another one. They were in no way impressive, but the allure and serenity of the valley had worked its magic upon us. 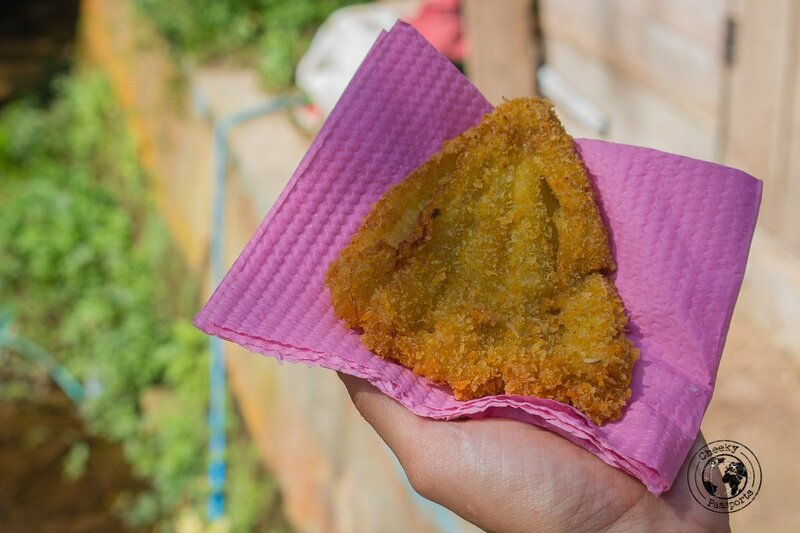 We happily walked along the foot paths greeting the banana sellers like a couple of little kids. 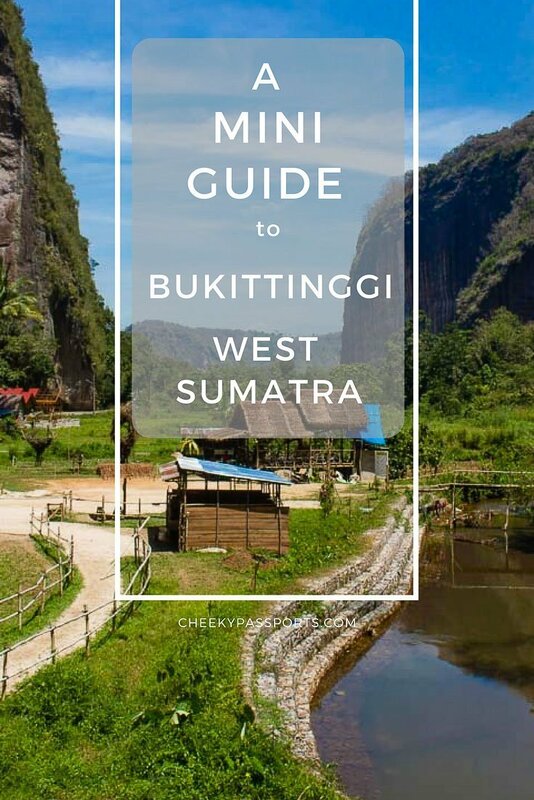 All in all, a fantastic day and possibly our favourite from our list of things to do in Bukittinggi! This pretty overpass connects Fort de Kock with Bukittinggi Zoo. Limpapeh bridge is considered to be one of the landmarks in Bukittinggi, but quite frankly, it is easily missable. The gorgeous silvery shining Lake Maninjau is quite a sight. It can be accessed by public transport, taxi, or by hiring a car or motorbike. If driving yourself, care is required due to the infamous 44 hairpin bends! 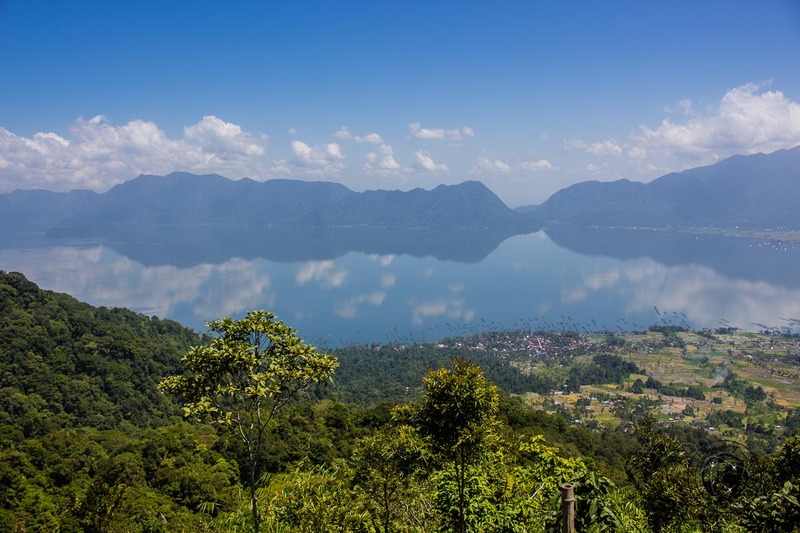 The lake is best seen from Lawang Park viewpoint just before the start of the hairpin bends. We stopped there first and enjoyed the cool breeze at the top of the hill so much that we stayed much longer than we intended to in the first place. We decided not to drive all the way down to the lake at that point but to continue driving around the Bukittinggi area to enjoy the scenery close by, which we had noticed was really beautiful. 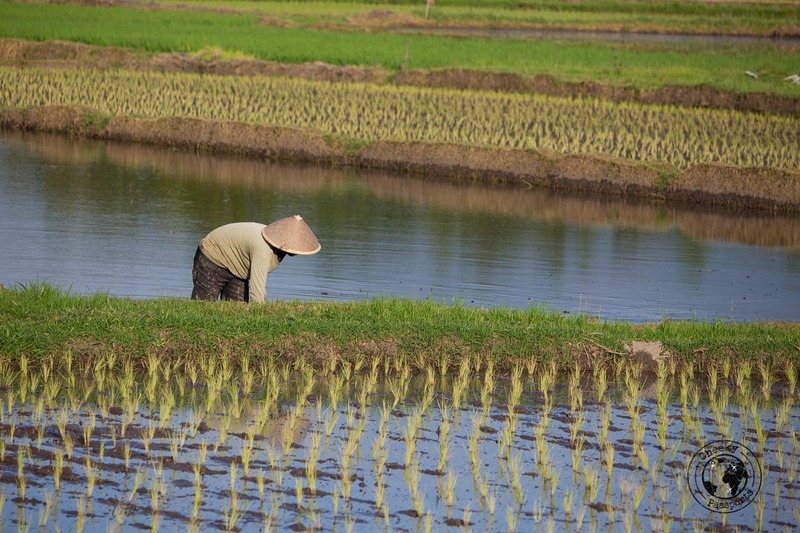 We drove through more rice paddies and past silver-domed mosques, stopping every so often to admire the wonderful views. Occasionally a local would stop to ask whether we had any problem with the bike and whether we needed any assistance. We had a simple lunch of soto ayam, nasi goreng and fried tofu in a little rural village for 26, 000 IDR (€1.65). The roads we went through were almost empty, giving us lots of space and comfort in which to drive. 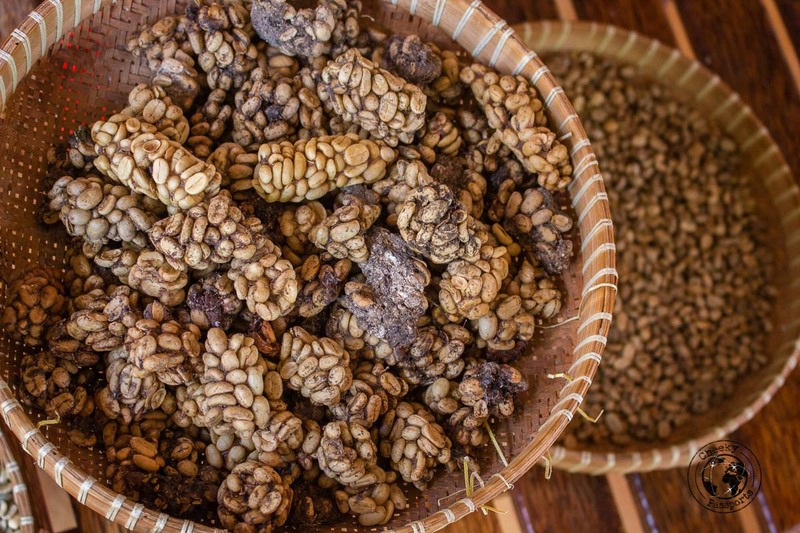 We had heard that in the small village of Desa Butang Palupuh it was possible to taste “ethically-produced” kopi luwak (civit coffee) which, as its name implies, is coffee made from the excrement of the wild civet cat, which is rich in coffee beans (being the cat’s favourite food). Not surprisingly, it is one of the most expensive coffees in the world. Although many companies in Indonesia produce this type of coffee, many keep the civets in captivity, an activity which we do not support! Rafflesia Luwak Coffee utilise excrement produced by wild civets which is collected by hand from the neighbouring jungle. You can buy a pot of coffee or other hot drinks, such as ginger tea if coffee is not to your liking. I thought the coffee was ‘allright’. It seemed very mild and I wasn’t too impressed to be honest. I guess that I just prefer stronger blends. Rafflesia Luwak Coffee also sell the packaged roasted coffee beans and coffee powder. This makes for an excellent souvenir to take back home, where expensive luwak coffee is all the rage at the moment! The organic processing of the coffee was explained to us as we sipped on our beverages and it was actually really interesting to learn all about the process. It is also possible to have a look at the Rafflesia flower in the same region when this is in bloom. Sadly, it didn’t bloom at all during our stay in Bukittinggi, so once again we missed seeing the world’s largest flower. The Rafflesia flower can also be viewed in Cameron Highlands Malaysia. 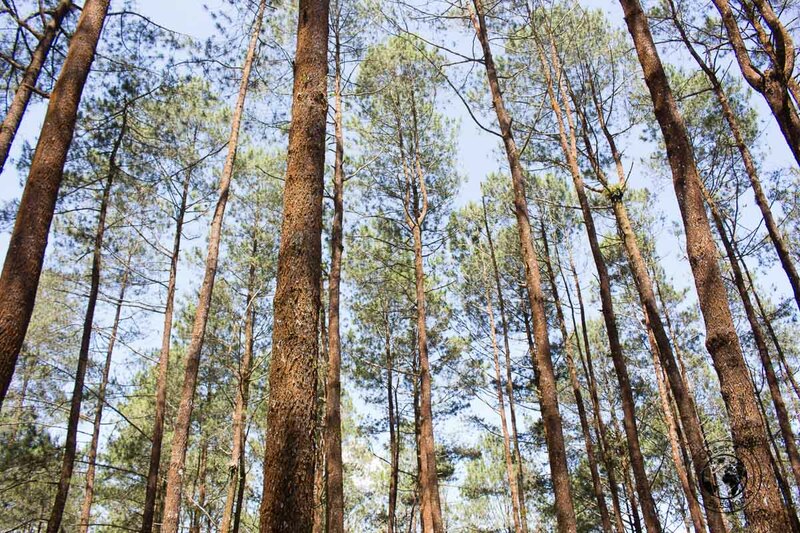 Yes, you can put this on your list of things to do in Bukittinggi! 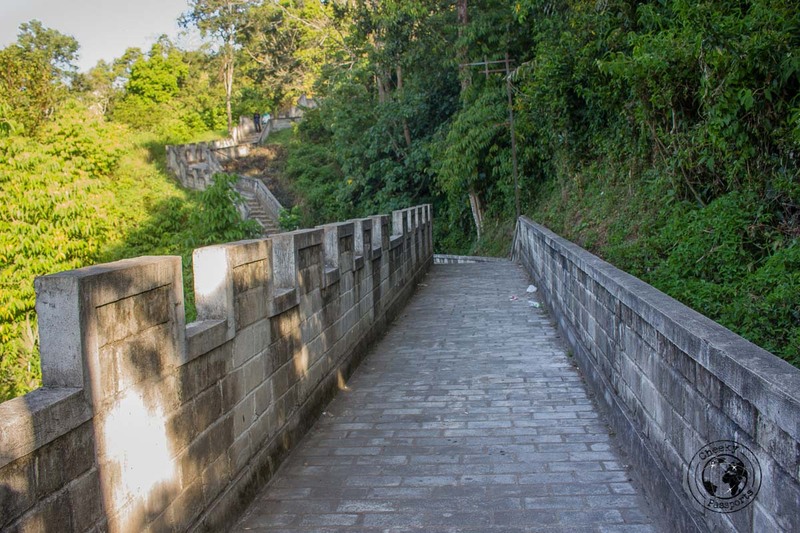 Bukittinggi, Sumatra has its own “Great Wall”, the Great Wall of Koto Gadang! Although we’ve never actually been to the Great Wall of China, we believe that Bukittinggi’s wall is a far cry from being anything like China’s best-known landmark! The wall can be accessed on the way down to the Sianok Canyon, the entrance is to the left. The stairs up the fortification are rather steep and we only made it up a few sections since Nikki’s injured knee protested painfully after being in the same position on the bike all day, and we thought it wasn’t worth going up much further. A separate donation was requested a different sections of the wall. We paid the first one and then refused to donate further since it seemed like quite a rip-off. 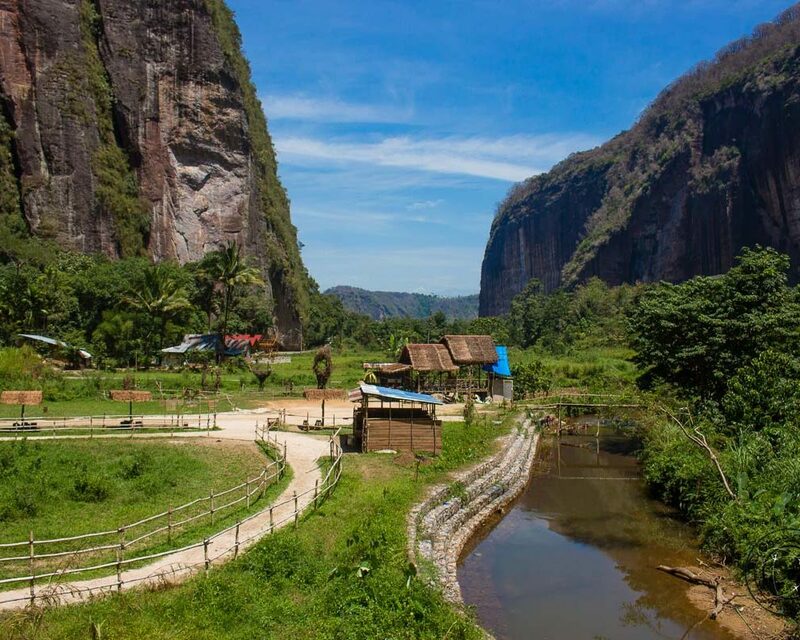 The wall was actually constructed to bridge Bukittinggi to the village of Koto Gadang over the Sianok Canyon. Despite its dubious name, this café/guesthouse was the perfect accommodation option for our stay in Bukittinggi. Location is very central and motorbike rental was available at 60.000 IDR/day. You can check availability here. Complimentary breakfast included several options from the actual menu including my beloved oatmeal, a rare find in Indonesia! Although the room was rather small, it included private bathroom (with really strong water pressure) and an a/c unit. A water dispenser was located just outside it. The place can be noisy when the bar is busy, but that is not very frequent! 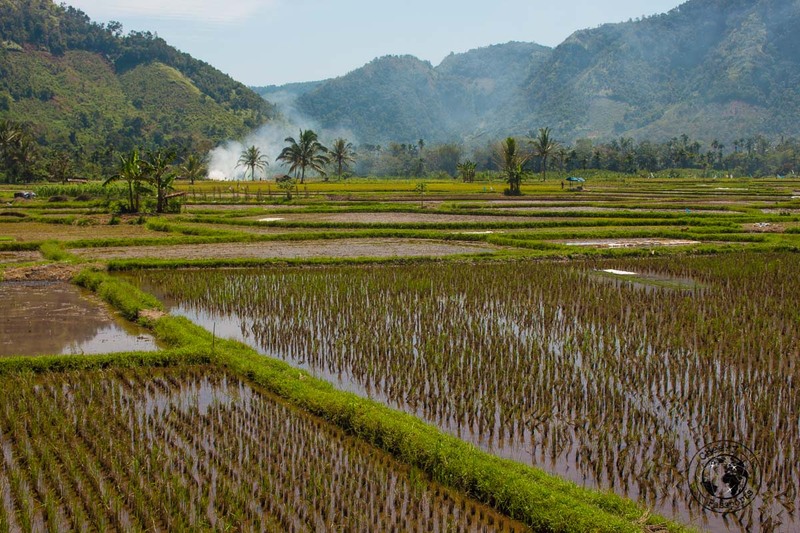 The area around Bukittinggi is spectacular! We ate most of our meals at the popular De Kock, the same café we were staying in, simply because the food was delicious! The café serves western and Indonesian meals and the stuffed baked potatoes topped with steak and cheese are the best! 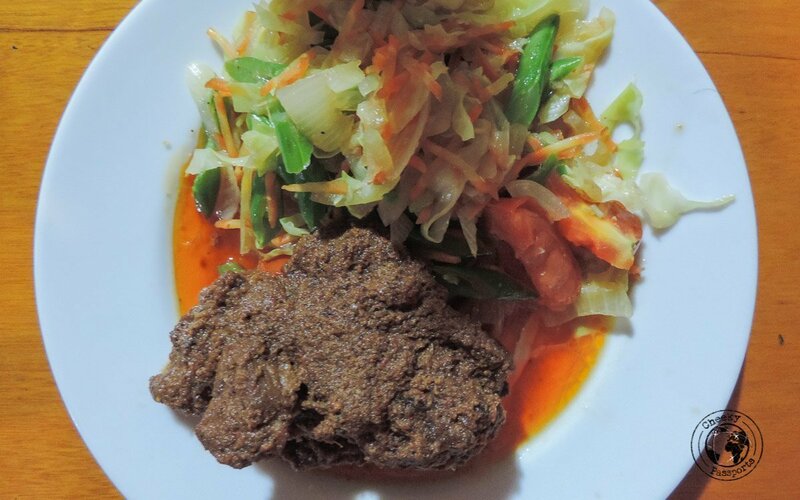 Turret Café was our second preferred choice for food in Bukittinggi. The food is good but the portions smaller than those at De Kock. The beef rending here is exceptional! Despite our long uncomfortable journey to Bukittinggi, we were able to enjoy a lovely few days’ retreat in the cool hillside town. We were surprised that the town was not popular with foreigners but welcomed having most of it to ourselves! Did You Like? Pin it!